This episode starts off with Ribrianne & 17 having a light-fisted verbal bout that pushed 17 into serious mode. As we saw last episode, 17 was joking around a bit with Kakunsa & Ribrianne until he grew tired of the battle’s pace & easily dismissed Vikal & Kakunsa from the ring with two powerful attacks. Ribrianne & Rozie being the only fighters left from their squad, Ribrianne is putting everything on the line to remove 17, who she demmed a fighter of darkness, from this tournament. While 17 has his hand full with Ribrianne, Goku seems to be cornered by Rozie, who has Goku against the ropes with her multitude of energy blasts. There’s even a point where Goku gets surrou ded by her energy blasts attacks & 17 has to come in to save him. However, it’s clear that Goku is testing the waters, especially since we know he could wipe the floor with Rozie if he decided to transform into Super Saiyan Blue. But as usual, Goku was trying to get a hold of his opponents fighting style & ultimately put Rozie in her back with a pretty cool strategy. Ribrianne comes to Rozie’s aid but as it looks like they’re both about to be pushed off the ring, Jimeze comes saves them using Instant Transmission. Meanwhile on another side of the ring, Gohan & Piccolo run into Botamo, who Gohan challenges to a bout. Gohan starts off hacking away at Botamo, but it’s to no avail because of Botamo’s ability to absorb physical attacks. However, Gohan’s intention was to continuously hit Botamo until his feet no longer touched the ground & send him flying out of the ring with a heavy punch & energy blasts. Gohan still retains his arrogance, but it’s moreso layered with humbleness. Although Gohan had a quick match with Botamo, his fight wasn’t over. 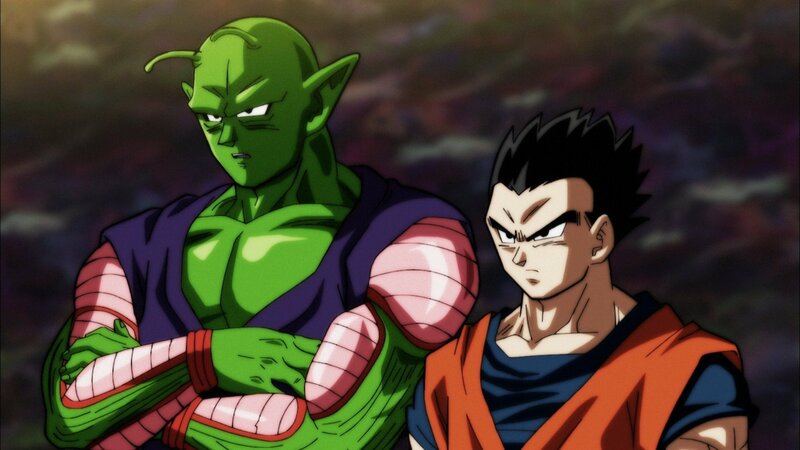 Obuni & Rubalt, the last two fighters from Universe 10 have challenged Gohan & Piccolo to a bout. Obuni goes after Gohan while Rubalt targets Piccolo. Gohan is having a hard time locking onto Obuni’s energy, which h in turn is making it impossible for hi. To land a hit, but Piccolo’s battle with Rubalt was swiftly over with Piccolo’s old school Hellzone Grenade attack, which knocked Rubalt out of the ring. The fight with Gohan & Obuni did look one-sided but that shifted once Gohan figured out that by letting Obuni hit him, he could counter with some damaging blows. Ultimately, Gohan did beat Obuni in this match but he also took a lot of damage while in his Ultimate form. Being that Gohan & Piccolo took out the last two fighters from Universe 10, this meant that Zen-Oh had to erase their universe. But before Universe 10 was erased, Gohan saw a pendant dropped by Obuni that held a picture of himself, his wife & child. This was a well-placed scene as it was a reflection of Gohan’s current life & what he has in the table. This is why I believe Gohan has something major up his sleeve & that we might see a new transformation from him soon. Episode 103 is a solid episode but still lacks steady pacing. Most viewers may feel that Gohan is being overlooked again, but I will tell you guys that feel this way to give it some time, as I feel we will see great things from our boy soon enough. Dragon Ball Super, Episode 103 - "Gohan, Show No Mercy! Showdown with Universe 10!!" Limited spotlight on Gohan for an episode highlighted with his name was a downer.